These tack rooms will take your breath away! 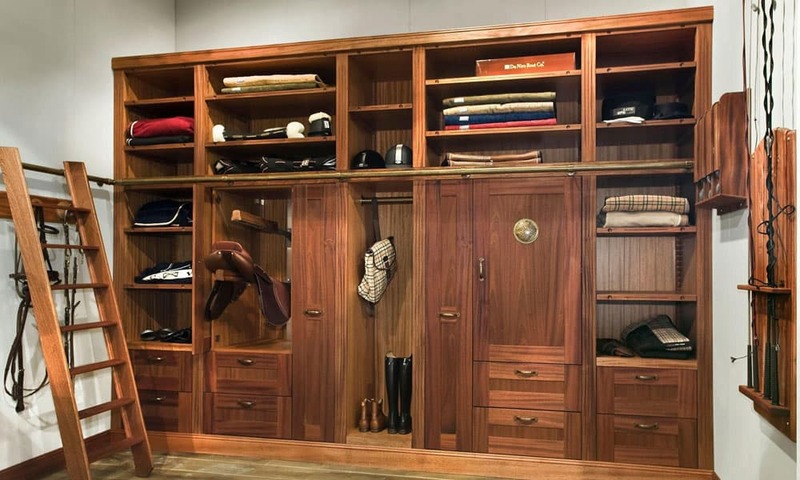 Some girls plan their dream closets, but other girls plan their luxurious tack rooms. If you ride horses, there’s a good chance that you fall into the latter of these two categories. These tack rooms prove that dreams really do come true. Get ready to fall in love with these gorgeous designs. I warn you though, you might get a serious case of envy! First off, laundry machines are a must! No one likes using their house washer for dirty saddle pads. Next, an organized space makes life so much easier! Saddles and bridles need to be quick to grab. Furthermore, every rider knows how handy a small sink would be for cleaning tack. Let’s talk design! What cowgirl wouldn’t love this western-themed room? PC: The Castleton House and Gallery Ltd.
And this brick floor? It’s too cool! There is literally a place for everything. Saddle pads, helmets, boots, etc. It all has a home! After seeing those, I’m ready to design my perfect tack room! What about you? Want to see more? Check out Fallon Taylor’s Tack Room Is Every Horse Lover’s Dream!